Site map, AVERS Science and Research Development Company - physiotherapeutic devices, "Doctor Light"
Physiotherapeutic device for hydro-massage with light emission "AVERS Shower"
Physiotherapeutic device, LED dummy "Doctor Light"
The "AVERS" research and production company has prepared for publication a new Manual for teachers of higher educational institutions and specialists in the field of medicine, biochemistry and biology - "THE EFFECT OF OXYGEN INSUFFICIENCY ON ANIMAL BODY"
During 2020, all efforts of JSC "Avers" will be dedicated primarily towards the testing of the following types of produce: phototherapeutic devices, physiotherapeutic devices, medical, veterinary and home appliance technologies. Good news for parents of kids below age of 4 : LED dummy "Doctor Light" for prophylaxix and treatment of respiratory viral infections now is available in Farmacy chain "36,6"
Patent for utility model No. 166124 "Phototherapeutic device for the prevention and therapy of young children"
Patent for utility model No. 166852 "Phototherapeutic device for oral, nasal, vaginal, rectal administration"
Patent for Invention No. 2532174 "A method for purifying of air mixture in surgery and maternity wards to remove pathogenic microorganisms, highly volatile organic and carcinogenic substances and regeneration of oxygen in closed premises"
Patent for Invention No. 2520147 "Gluten-free wafers and method to produce them"
Useful model patent No. 137468 "Pacifier "AVERS"
Patent for invention No. 2486231 "A method for increasing the antiknock values of motor fuels made of straight-run gasoline for gasoline engines and injection engines"
Patent for Invention No. 2478952 "A Method for Sorting of Beef Into Quality Groups (PSE, RSE, NOR and DFD)"
Patent for Invention No. 2477471 "A Method for Sorting of Meat Into Quality Groups (PSE, NOR and DFD)"
Patent for invention No. 2463089 "A method for prophylactics and treatment of diabetes mellitus through making effect on the patient by blue spectrum light and as a part of combined therapy"
Patent for invention No. 2459574 "Method and system for determination of the area and extent of a patient’s affect and first-aid treatment in cases of burns, by means of visible light spectrum and ultrasound"
Patent for invention No. 2456825 "ERAVIT" biologically active additive to foodstuff with antioxidant effect and the preparation method"
Patent for invention No.2454504 "Method and system of deriving mass of blue-green algae from water reservoirs for human needs"
Patent for invention No. 2438302 "A Method for Increasing the Live Weight Growth in Pigs in Intensive Raising Technology"
Patent for invention No. 2439557 "A Method of Determining the Beef Quality During the Lifespan of Livestock for Slaughter"
Patent for invention No. 2419378 "Mode of visualization of diseases of internal organs through visible-light spectrum"
Patent for utility model No. 105118 "AVERS-Aqua-Farmer device for the removal of blue-green algae from water reservoirs with subsequent usage of them"
Light emitting bath-incubator for newly born and prematurely born babies. Optic-electronic device for gums and dental irradiation to fight Periodontitis. 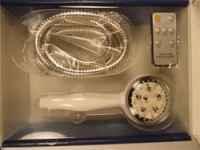 Light emitting bath tub for treatment of chronic arterial deficiency of the lower extremities. Toothbrush with a visible light spectrum monochromatic emitters. A tampon with a visible light spectrum monochromatic emitters. An optic matrix with a visible light spectrum monochromatic emitters for use in a computer mouse. Light Emitting head band Vibrating massager with a visible light spectrum monochromatic emitters. Good for every day use and treatment of cardio-vascular diseases (Ischemic diseases, arterial deficiency of the lower extremity and diseases causing thickening of the blood) also Orthopedic diseases (Osteochondrosis and Arterial Arthritis of joints).